We know how to replace a field using #ajax in a form. Can we update multiple fields using #ajax in a form? Yes, we can update multiple fields using #ajax in the Drupal 7. We can achieve it using ajax_command_replace() in Drupal 7. For more details about ajax commands on Drupal 7, please visit https://api.drupal.org/api/drupal/7.x/search/ajax_command. Consider the following example. In this example, I've created a form with fields First, Second & Third name. I tried to update the Second & Third name fields when focus out on the First name field. 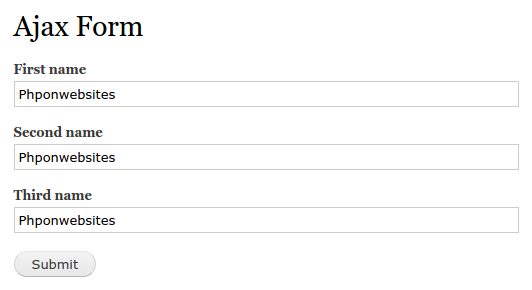 Now I hope you know how to populate multiple fields using #ajax in Drupal 7 forms.